My first post, my first 3D printer and my first "DOH!" I'll be honest and say I wasn't expecting a Rolls Royce, but yeap, the poor quality of the T nuts and matching (hahahahahah) bolts, is preventing me from completing the build. After I kick started my old steam powered verniers, some of the M4 bolts only measure 3.8mm diameter on the thread. That wouldn't be so bad if it wasn't for some on the T nuts measuring 3.6 and 3.7mm inside the thread core. 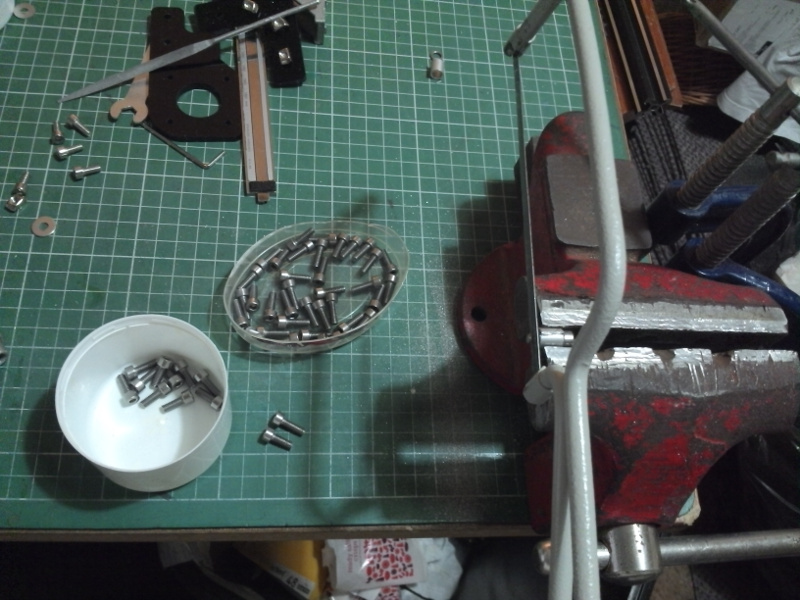 So as soon as I apply a little pressure on the allen key, stripped threads! And I even have two that allow the bolt go go almost through just by pushing it in there. Come on Tevo, your suppliers are selling you garbage! The thread core of an M4 should be 3.3mm +/- 0.1 and it follows that the bolts should be no less than 3.9! So I'm now waiting for some appropriate replacements, also made in China, (heh), from an ebay seller in Walsall. I know,I know. I did look at some from a UK based company but they wanted £20 minimum postage for a £10 order . . . 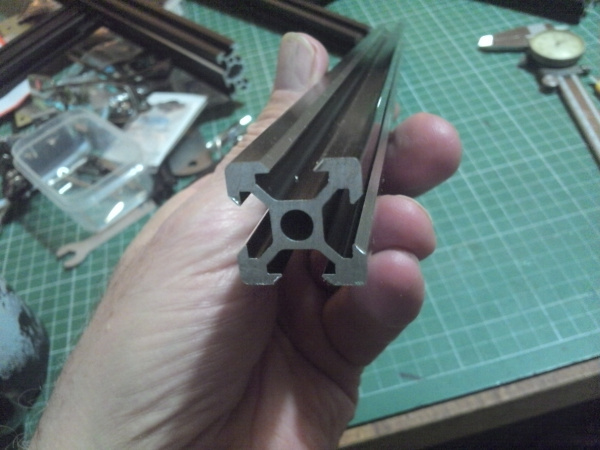 I'm not happy with the form of these extruded ally rails. There's no flat surface for the wheels to roll on, just a pair of small ridges running along the length of each one! To my way of thinking, they look like rejects from a supplier who was supposed to make V groove extrusions. If you think about that, it seems pretty logical. So I'm about to break down. Yes, break down the stuff I put together so I can take it to work on Monday and work out which machine I can use the re-work a decent looking chamfer on them. I've seen some alternative extruded rails on the net and I'm confident I can replicate a fair copy. Then all I'll need to do is to relocate the positions of the fixed rollers on the Tarantula to take up the, (estimated) 1mm or so of slack created by the loss of material on each "face" of the V.
Engineeringwise, we're 'aving a larf! Re: Unable to complete my Tarantula due to dodgy parts! From what you wrote about the alloy extruson, it could be "Item" compatible profile. 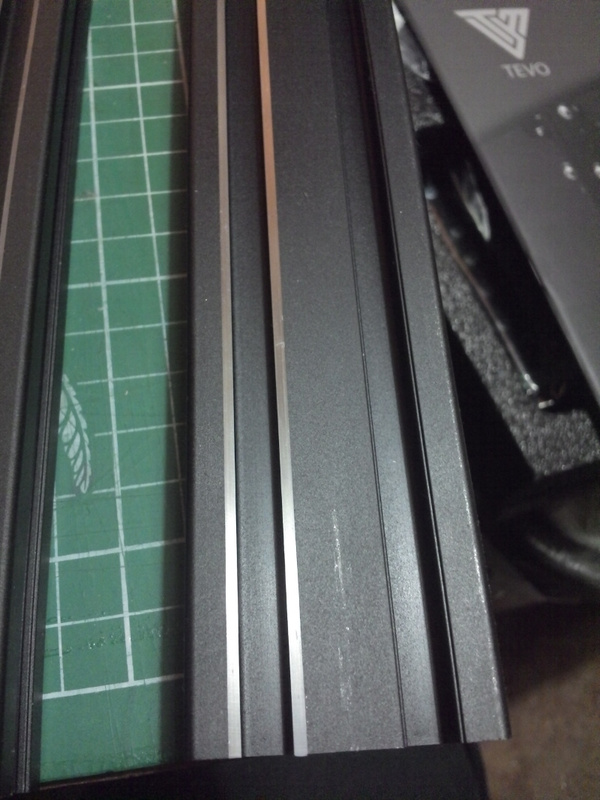 They have a ridge to guide a plastic slot cover. I see what you mean o_lampe, But I still say they're not right. Delrin is a good product, we sometimes machine it for one or two of our customers. Anyhoo, let me try and post a pic or two of what I've done to the extrusions. I had to carefully file all the edges at the end of each extrusion to remove any burrs and sharp edges. And there's a pic of cutting down 50 M4 bolts. That was tedious let me tell you! Argh! I'm trying to upload a video of the machining process to Flickr, but it keeps timing out before it finishes! Edited 1 time(s). Last edit at 12/23/2017 10:02AM by cheapo.